Here’s the inspiring story of Mother Cabrini, the first American citizen to be declared a saint. As a child growing up in Italy, she dreamed of one day becoming a missionary. But how—and where—God’s plan for her finally came about was a surprise, even to her! 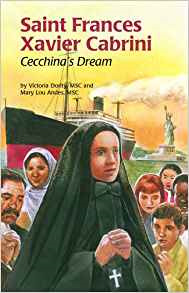 Written with authority by two sisters of the Order Mother Cabrini founded, the Missionary Sisters of the Sacred Heart, this exciting book will introduce children to one of our most beloved American saints.